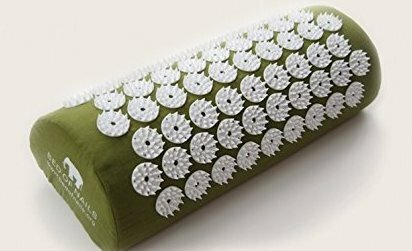 Covered with 2142 nails, the pillow measures, 14.5"x4"x6" New holistic gadgets to stop pain, stress and tension. Bed of nails can help improve circulation, increase energy level, relieve chronic neck and back pain, reduce stress and anxiety. Also can improve sleep and relieve insomnia, improve skin complexion, relieve constipation, cellulite treatment, revitalizing and rejuvenating. Cover can be removed and hand washed.